Crime is a function of opportunity. Cars, metal, building materials, tools, and other equipment are tantalizing targets for thieves. Aside from perimeter fencing to limit access, security guards, and adequate lighting, security cameras can increase the protection of your business. 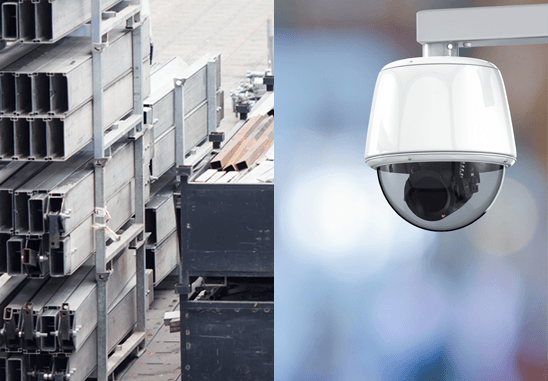 In lumber yards, car dealerships, or construction sites, security cameras act as both a deterrent and documentation tool. What Do You Need/Want to See? The first step (in protecting a business) is to estimate the size of the area you are observing and how much detail you need to view in the video capture. If the location of the site is not compact, different types of cameras can cover many separate areas. Resolution — A typical analog camera captures around 0.4MP (megapixels). In contrast, digital IP camera resolutions start at 1.0MP (720p). They are also available in, 1.3MP (960p), 2MP (1080p), 3/5/8MP (4K UHD), and 12/33MP (8K UHD). All vastly sharper than standard analog resolution. Versatility — IP security cameras are linked directly to a wireless or wired network. Camera placement is possible wherever a network connection is available. Capability — Video Management Systems (VMS) can be deployed with IP cameras to allow for auto-tracking, active tampering, night vision, and people/vehicle counting. Cost savings — IP cameras can use the same coax cabling as traditionally powered cameras or run off of cost-effective Power over Ethernet (PoE). Convenience — IP Cameras send video via a “local area network” over the Internet enabling on demand viewing and recording at specific times. Certain camera configurations allow recording when triggered by motion. Coverage — Units are available in standard fixed position and multi-imager models. The advantage of the latter is that they utilize one IP connection with multiple cameras in one small housing, all viewing in different directions at the same time. Inventory and Storage Spaces — Putting cameras in where your most valuable stock exists is the logical place to start. Loss prevention begins with deterrence and observation. With IP cameras and professional intrusion alarm monitoring Safe Systems, you will receive notification when someone enters a restricted area or is present at an unusual time. Our professional operators swiftly communicate with the proper authorities when a security event occurs. Building Entrances, Exits & Gates — Strategically placed cameras will allow you to keep track of who is entering and leaving your premises, and whether they have permission to be there. Auto-tracking is an advanced video utility that can sense motion of a moving vehicle and track it inside the camera’s range of coverage. For example, if you want to capture the license plates of all delivery vehicles, auto-tracking would only activate at entry and departure. Loading Docks — Surveillance of entry doors, loading docks, and building exteriors is an essential part of a comprehensive security plan. The task can be efficiently accomplished using tamper-resistant, dome cameras, with nighttime and high contrast capabilities. Cameras with megapixel functionality may cover vast areas without losing quality. Digital zoom capabilities in modern IP cameras/recorders allow large area views to be blown up for detailed viewing. Secluded Areas — Parking lots, access roads behind buildings, and dumpster locations are critical areas to place security cameras. Aside from theft, these are areas where other security events historically take places such as accidents, acts of violence, and vandalism. A Safe Systems business security expert can help design an outdoor camera system that meets all your requirements. Our team will specify the right products to create a reliable solution inside and outside of your facility. Minimalizing outdoor quality issues that arise from bugs, weather, and moisture is another concern. After installation, our technicians ensure that the equipment is in optimal working condition by conducting proper cleaning and adjustments as part of your service contract. The result is a cameras solution that will operate when needed. Call 1.800.446.7519 for information or to schedule a free consultation.